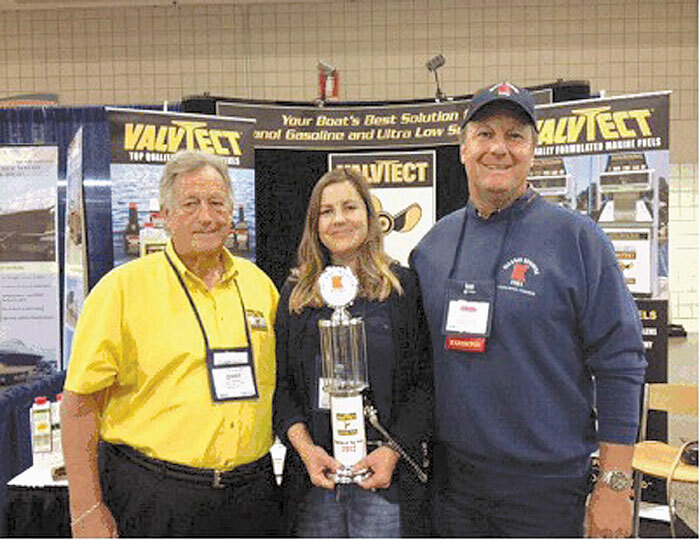 At a gala dinner at the International Marina and Boatyard Conference (IMBC), Island Marine Fuel of Balboa Island in Newport Beach was presented with the 2012 ValvTect Marina of the Year award. Chosen for its outstanding customer service, environmental stewardship, contributions to its community and extensive marketing of ValvTect marine fuels, Island Marine Fuel has a long and rich history in the Balboa Island/Newport Harbor area. The company’s history dates back to 1913, when Joseph Beek arrived in the Newport Beach area from Los Angeles. After serving as the community’s first harbormaster, Beek opened Island Marine Fuel on Balboa Island in 1933. The company, now operated by Joseph Beek’s grandson David Beek, has become an iconic fixture of Newport Harbor — home to more than10,000 registered vessels. Island Marine Fuel has no slips for vessels to dock, but it has the longest fuel dock in Newport Harbor and can accommodate vessels up to 160 feet. It provides oil changes, is an official California used oil collection depot, has a full mini-mart and a marine hardware store, offers fresh bait and has a full-time master marine mechanic on staff. Known for its extensive support of the Newport Harbor community, among the many events Island Marine Fuel sponsors is the Hoag Cup Regatta, which has raised more than 500,000 for Hoag Hospital of Newport Beach. The company has helped raise a similar amount sponsoring the CHOC Regatta for Children’s Hospital of Orange County. Island Marine Fuel also sponsors the Zane Grey Fishing Tournament, and its founder created the world-famous Newport Beach Christmas Boat Parade, reported to be the oldest and largest boat parade in the world. For more information, visit valvtect.com.